Hastings Park Noosa is a leisurely 45-minute drive north from The Sunshine Coast Airport located near Maroochydore or approximately a 2-hour drive from Brisbane. The resort overlooks Noosa’s main beach and is just steps from world famous Hastings Street with its abundance of restaurants, shops and boutiques. The location could not be more perfect as the resort is also only a short stroll along the waterfront boardwalk to Noosa’s magnificent National Park. Many of Noosa’s world-famous surf beaches are nearby. The breaks at First Point on Main Beach are just across the road and home to the Noosa Festival of Surfing held in March each year. The main access points to the Noosa River ferries and river cruises is within short waking distance. Explore nearby hamlets within Noosa shire such as Noosaville on the river, Sunshine Beach south of the National Park and Noosa Junction: with cinemas; supermarket; and, boutique stores. Noosa is a gateway to the stunning Sunshine Coast hinterland with heritage towns and spectacular landscapes. 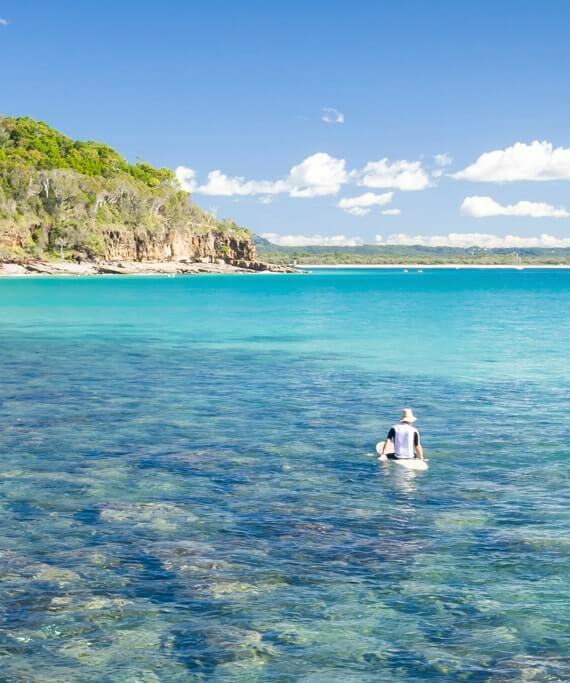 Noosa also offers convenient access to the coloured sands at Rainbow Beach and World Heritage listed Fraser Island. Whether you just want to chill out at the resort or explore all the region has to offer, Hastings Park Noosa is the ideal base for your perfect Noosa escape.